Review date: 6 October 2000. If you've got something that takes Flash memory cards - a digital camera, an MP3 player, a palmtop computer - you probably also need a way to read and write those cards from your PC or Mac. What you need is a card drive. People refer to these card drives as "readers", but they're all read-write. 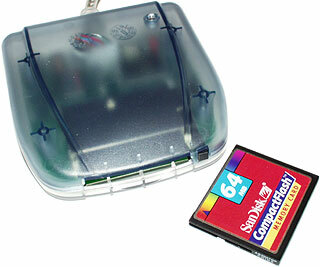 Essentially, a card reader lets you use a memory card as ordinary removable storage. It shows up like any other drive. Older digital cameras practically require a memory card reader, because the only other way to move data from camera to computer is down a serial cable. The fastest speed most serial ports can handle is 115200 bits per second, which works out at little more than 10 kilobytes per second. Which makes a floppy disk look like a speed king. More recent digital cameras have better computer connectivity - usually a Universal Serial Bus (USB) connection, that lets you use the camera itself as a card drive. This is all very well, provided you've got a USB-capable computer, but if you're doing your photography in a production situation you'll want a reader whether or not your camera's got a fast transfer option. A reader lets you use a couple of cards, plug one into the PC and start transferring the files, and get on with taking pictures on the other card during the few minutes it can take to empty a large capacity card. Readers also, of course, let you easily load up your MP3 player cards with songs, dump a pile of data for use on your little Windows CE machine, or just press your memory cards into service as general purpose file transfer devices. The price per megabyte of flash memory makes it terrible value for money if you want something to use as removable storage. Unless you're going to spend time in oscillating magnetic fields or dusty, hot, high-vibration environments, a Zip drive is a much better option for small-to-medium file transfer purposes. A pair of 64Mb memory cards - never mind a drive to put them in - will cost you less than $AU550, but not a lot less. For that kind of money, you could buy one of Iomega's funkalicious (a technical term) USB 250Mb Zip drives and five disks. And get about twice the storage on any one disk. But let's assume you've got the memory cards already. If you do, they're probably from the two most popular types, CompactFlash and the melodiously titled Solid State Floppy Disk Card or SSFDC, also known as SmartMedia. There are other Flash card types. MultiMediaCard (MMC) is gaining some popularity in devices that need storage that's even smaller than SmartMedia, and Sony's Memory Stick is hugely popular with, uh, Sony. SmartMedia, CompactFlash and Memory Stick all cost about the same for cards with the same capacity; MMC is considerably more expensive. 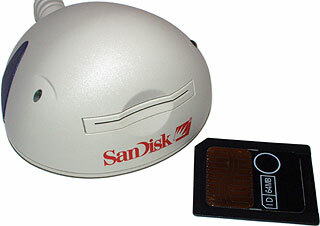 I've checked out four memory card readers, all from flashmemory.com.au, that work with CompactFlash and/or SmartMedia cards - the SanDisk SmartMedia ImageMate USB and CompactFlash ImageMate USB, the Power Quotient International SSFDC/Compact Image Reader, and the Datafab MDCF-FW. Your first decision when you're shopping for a card reader is what interface to use. There are a few ways to connect a card drive to a computer. The oldest, and nastiest, is the parallel port. Parallel has the advantage of ubiquity. A parallel port card reader can be used on any even vaguely recent PC. You need a parallel port that's "bidirectional" - can transfer data both ways - but since bidirectional parallel ports debuted with IBM's original PS/2s back in 1987, it's safe to say that you've got one. Since then, parallel ports have got considerably faster, to the point where you genuinely can use them for regular storage devices and not watch the planet get conquered by sentient cockroaches before a 50 megabyte transfer finishes. And parallel works with laptops. It works with Windows NT. Heck, it probably even works with Linux, if you've got a driver for your reader. It won't work with Macintoshes, because they don't have parallel ports, but you can't have everything. On the down side, using the parallel port for serious data transfer is like using chihuahuas as attack dogs. It's just not suited to the task. Amazingly enough, current PC parallel ports are capable of shunting data back and forth about as fast as USB. But even cutting edge PCs take a monster performance hit while the parallel transfer's happening. Welcome to molasses mode. The other two old-fashioned interfaces for card readers are IDE and SCSI. IDE card readers plug into the same interface that's been used for PC hard drives for years and years (and CD-ROM drives for almost as long). All modern PCs have twin IDE connectors on the motherboard, each of which can support up to two devices, so it's usually easy enough to find room for an IDE reader. Recent Macs have IDE controllers, too. IDE readers have to be internal devices, though, because IDE cables can't be longer than 40 centimetres (18 inches). If you're out of externally accessible drive bays, or you've got four IDE devices already, or you want a card reader you can easily take with you to another computer or use with a laptop, IDE is not for you. SCSI readers work in any computer with a SCSI controller - older Macs, PCs with high end motherboards, or any computer with a SCSI card. SCSI controllers can all handle at least 7 or as many as 15 devices, so you can probably fit a card reader into the chain. But most such readers are internal devices - they can be external, but usually aren't, unless you mount them in a general purpose external case. And they're not cheap; even if you have a SCSI controller already, the reader itself will be considerably more expensive than USB or parallel alternatives. If you're using SSFDC or MMC or Memory Stick, you don't actually have to get a regular reader at all - you can use a "FlashPath" adapter that looks like a floppy disk, but has a slot you put a memory card into. Run drivers that let your PC or Mac understand a "floppy" with way more than floppy capacity, and you're away. 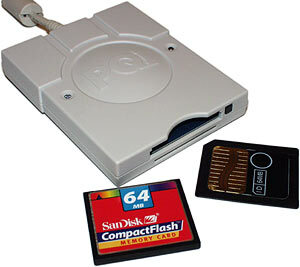 FlashPath only moves data as fast as a floppy can, which means about 40 kilobytes per second, with a following wind. Why, at that speed, the entire contents of a 64Mb card could be shifted in a mere 28 minutes! A FlashPath adapter also costs $AU200 or so, runs from little lithium batteries that need replacement now and then, and doesn't work in LS-120 drives, in the unlikely event that you have one of these unpopular Zip competitors. Which, along with the fact that FlashPath adapters for CompactFlash don't exist, could explain why proper card readers retain their popularity. USB's the most common interface for card readers and similar medium-speed devices. Three of the readers I checked out use it. If it works on your computer, and the drivers for your card reader aren't flaky, USB's great. Plug and play, hot swapping, lots of devices hanging from inexpensive hubs, lovely. But only Windows 98 and later, and Windows 2000, support USB in the Wintel world - WinNT doesn't, and Windows 95 doesn't either unless you've got the very last revision of it with all the right patches, a following wind, and (I am reliably informed) an official dispensation from the Pope. USB ports are easy enough to come by - all current PCs and Macs have 'em, and adding 'em with a simple $AU65 PCI card is simple enough if you've got an older machine. Windows 95 and 2000 have built in drivers for USB root hub cards. And then there's IEEE-1394, or "FireWire". The Datafab reader uses this interface. FireWire was invented by Apple, and has the simple plug-and-go operation of USB with the speed of a hard drive interface. "FireWire" is an Apple trademark; IEEE-1394 is the generic non-Apple name. FireWire's maximum data transfer rate is 400 megabits per second, which is about 48.8 megabytes per second. It can't actually shift real user data quite that fast. As with every other data transfer system, taking the raw signalling rate as representative of the amount of user data moved is a bit like multiplying the number of people you can possibly fit on a bus by the number of buses that go past, and deciding that that's how many people have used those buses today. But 1394 is still bloomin' fast. Considerably faster than USB, whose ceiling speed is 12 megabits per second - less than 1.5 megabytes per second. The new USB 2.0 standard has more ceiling bandwidth than FireWire, but don't expect to see much that uses it in the near future. FireWire hasn't achieved much mainstream popularity partly because of vicious-circle critical-mass problems - without many users, there's not much reason to make devices, and without many devices, you don't get many users - and partly because USB works just as well for many devices. There's no point using FireWire for storage devices whose native speed is less than, or not much more than, plain USB bandwidth can handle. FireWire was never meant for use with mouses and keyboards and domestic printers and so forth; it's a video and storage interface. Various Digital Video (DV) cameras come with FireWire connections for fast, zero-loss data transfer to and from editing machines, and some high-end digital still cameras have 1394 ports as well. It's even showing up on some cheap-ish scanners. Recent higher-spec Macs have FireWire ports as standard, but practically no PCs do, so you've got to add them with another controller card. Windows 98 and 2000, again, Just Work with the 1394 card, but you'll be paying considerably more for it - three port FireWire cards are going for $AU200 or so at the moment. You can get them for $US55 or so in the States. I benchmarked all of the readers with the drive-throughput tester HD Tach, doing read tests only. This was partly because of my own native laziness, and partly because most PC card drive use is reading - sucking pictures out of the card and then deleting them. Flash memory is considerably slower on writes than it is on reads. All three CompactFlash-capable readers can handle Type II cards, which are a little thicker than the standard cards and have higher capacities, but are electrically identical. A few somewhat affordable digital cameras and other gadgets can take Type II cards. The primary attraction of the thicker cards, in case you're wondering, isn't just bigger and bigger Flash memory units. You can get 300Mb Type II memory cards, but you'll be paying more than $AU1350 for one, which is a shade ridiculous. It's not too bad on a dollars-per-megabyte calculation - $AU4.60 per megabyte or so, versus about $AU4.10 per megabyte for a 64Mb Type I card - but it's a lot of money nonetheless, and you can do better. IBM's Microdrives are Type II CompactFlash form factor hard drives. They are, I am given to understand, made by elves. A 340Mb Microdrive's less than $US250 from various dealers these days, and 512Mb and 1Gb versions are available too. The price for a 1Gb Microdrive's about $US500. So even if you pay $AU1500 for one, it's still only $AU1.50 per megabyte. OK, so a 45Gb IDE drive may give you 45 times the capacity for half the price, but it's also about 42 times the weight. The Microdrives may be tiny, but they're much more tolerant of rough handling than regular hard drives. They've got a 175 gravity (G) operating shock tolerance (for a two millisecond shock, such as you get when you drop something onto a concrete floor), and a hefty 1500G non-operating rating. This compares with versus 55G and 225G, or thereabouts, for plain 3.5 inch drives. This isn't as amazing as you might think - the gravities you subject something to depend on how far it's fallen, but also on how unyielding the floor is. Something dropped from two metres has to be able to punch into the floor about one centimetre in order to decelerate at only 180 gravities, on average. If the floor's not carpeted, that ain't gonna happen. And things don't decelerate smoothly when the floor they hit isn't part of a house in Physics Experiment Land, where all cows are spherical, frictionless and inelastic. In the real world, dropped things bounce around. Drop something onto an unforgiving granite slab in the real world, and you can easily exceed 1500 gravities from only four inches up. That said, though, no especially persuasive evidence has been presented to suggest that Microdrives are particularly fragile, or prone to early failure for other reasons. Not that lots of them haven't failed, but then lots of them have been sold. So far as can be determined, IBM's Microdrive elves have done a very good job. Here's your basic USB SSFDC reader. Neat styling, power and activity lights on the side, simple and straightforward. As with many USB devices, you're meant to run the driver installation utility and then plug in the reader; if you do that, the Windows setup process is trivial. It's got drivers for Windows 95 and 98 included. If you want Macintosh or (currently beta) Windows 2000 drivers, you can download them from SanDisk here. Like many SmartMedia slots, the one in the SDDR-09 has no special eject mechanism - you push the card in, you pull it out. Enough of the card sticks out to make this easy. SmartMedia devices that more completely swallow their cards have a push-in, push-to-eject mechanism, but that costs money. SanDisk have saved a bit more money on this gadget by not "keying" the SmartMedia slot - the card's meant to go in with the groovy-looking contacts down, but you can put it in the wrong way up, or even completely backwards, with no trouble. Doing this doesn't cause any harm to anything, but it may well confuse the user. CompactFlash cards and slots are all keyed; you can only fully insert the card if it's the right way around. In benchmarking, the SDDR-09 did perfectly well - more than 840 kilobytes per second read speed. This is about as much as you can expect from any USB storage device. At less than a megabyte per second, it can take a little while to empty a large capacity memory card, but the transfer just chugs away in the background and you can be looking at or editing your first pictures while the rest of them pump through. This, by the way, is exactly the sort of thing that you totally can't do with a system-paralysing parallel port drive. The SDDR-09's a little pricey, but it works. This is the new model CompactFlash ImageMate. They made one that looked like the SDDR-09, above, but this isn't it. It's got the same low-profile soap-on-a-rope look as many other readers, instead of the half-an-orange older shape. It's also satisfyingly heavy. SanDisk have stuck a metal weight inside the plastic case to give the reader some heft. The card slot's the usual press-and-pull type with no eject button, but this reader's still pleasant to use. This time there are drivers for Windows 98 and 2000 included, and there are Win95 and Mac drivers available for download here. With better than 870 kilobyte per second read speed, this SanDisk reader's as fast as you'd expect it to be, just like its SmartMedia sibling. You can't get much more than this out of USB. This looks more like it, eh? SmartMedia and CompactFlash slots, for barely more than a hundred Australian bucks! If you have to deal with both CompactFlash and SmartMedia, a dual-slot reader is a great idea. Since most MP3 players use SmartMedia, but a lot of digital cameras use CompactFlash, many gadget-lovers have both kinds of card. And some people, like me, have an Olympus C-2500L digital camera (reviewed here), which has both kinds of card slot built in. This reader's just two devices in one. You get two separate drive letters; everything works exactly as if you had a pair of USB drives installed. Unfortunately, the PQI reader isn't all that it might be. PQI claim that their driver set - an updated version of which can be had from their download page here - works with Windows 95, 98, 2000 and NT. That's apparently actually true, too; USB devices in general don't work at all under NT, but you can do it with an appropriately hacked driver, and it would appear that PQI have made one. I don't know whether it's the software, the hardware or both, but the PQI reader was... characterful... when I tried it out. The quirkiness starts with the card slots. The CompactFlash slot is a button-eject type, but it's a bit stiff and the light weight of the reader means you really need both hands to pop out a card, just as you do with a plain pull-out slot. If you're using both slots, removing the CompactFlash card without removing the SmartMedia one is really fiddly. The SmartMedia slot is a pull-out type, but you load the SmartMedia card with the contacts up, not down. As with the SanDisk reader, the SmartMedia slot's not keyed in any way. The manual doesn't even tell you which way in to put the card. Initially, something about the PQI SmartMedia drive gave HD Tach a giant electric conniption. It gave perfectly sensible results for the first four-sevenths of the SmartMedia card, then decided for no evident reason that it was looking at one of humanity's faster storage devices. The minimum read burst speed was a slightly suspicious megabyte per second or so, but the maximum was in excess of two gigabytes per second. I downloaded and installed the updated drivers from PQI's site, and suddenly I didn't have a faster-than-a-speeding-bullet SmartMedia device any more. It still benchmarked strangely high, though - almost 1770 kilobytes per second read speed. Sorry, but you just can't pump 1.73 megabytes per second through a 12 megabit per second USB connection. There are only 1.43 megabytes in 12 megabits. The CompactFlash side of the PQI reader at least had the decency not to tell me it could fit a quart in a pint pot, but now it seemed strangely slow - less than 590 kilobytes per second. So I ditched HD Tach, and resorted to the wooden club of the storage device benchmarking world - copying files around. It only took about three minutes and 15 seconds, plus 30 seconds of flogging after the copy, to shift 58.2 megabytes of files to the PQI's CompactFlash side. The after-copy flog is, I think, the fault of the PQI drivers, which let Windows say it's finished copying when the reader hasn't actually written all of the data to the card. But, in any case, its speed isn't too lousy in the CompactFlash department. But its SmartMedia performance is woeful. It took about 6 minutes and 30 seconds to copy a single 60.2Mb file onto the PQI's SmartMedia side, followed by maybe another half minute of card-flogging. Copying the file back (after restarting, to make sure no huge chunks of data were sitting in Windows' drive cache) took one minute 50 seconds. Not that Windows ever had the slightest clue how long the copy was going to take. In Win98, it blitzed through three quarters of the copy, as far as the progress bar was concerned, confidently predicting 10 seconds to go. Then it said there were 15 seconds to go, for minutes on end. Then it finished, except it hadn't really, as detailed above. Even if I generously ignore the post-copy flog-time, the PQI only managed a woeful 158 kilobytes per second write speed. And its read speed was a less-than-great 560 kilobytes per second. For comparison, when I tried the same file on the same card in the SanDisk USB SmartMedia drive, it scored about 380Kb/s write, 790Kb/s read. The read figure's close to the raw average transfer rate dor the SanDisk reader reported by HD Tach, as you'd expect it to be. The 50 kilobyte per second difference is down to the overhead involved in actually moving a real file, rather than just doing baggage-free read operations, as HD Tach does. To see if the PQI just didn't like big SmartMedia cards, I yanked the 64Mb card and replaced it with an 8Mb It took a mere 17 seconds to copy a 7.74 megabyte file onto the card - but the post-copy card-flog went on for another 45 seconds. Ignore that extra and it's better than 465 kilobytes per second write speed, but if you take the real copy time into account it's less than 130 kilobytes per second. Gak. There can be substantial differences in speed between different SmartMedia devices using the exact same card, because SmartMedia achieves its super-svelte form factor by having no controller hardware built into the card. Every SmartMedia device has a SmartMedia controller of some sort in it, and different controllers have different performance. 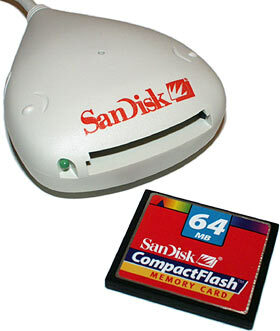 CompactFlash devices, on the other hand, have a controller built right in that knows how to make the card behave as a PCMCIA memory card or a plain IDE device. So different CompactFlash cards can have quite different performance, but, all other things being equal, any given CompactFlash card should give the same performance in whatever you plug it into. I don't know what the PQI reader's hardware and/or software is doing to make it sluggish, but it is, and it's especially lousy for SmartMedia. Apart from its looks, the Datafab CompactFlash reader is unusual only in that it uses IEEE-1394. FireWire shines as a high speed plug-and-play interface for mass storage devices. You can already get cradles that accept one or another kind of hard drive and turn it into a FireWire device - Datafab make ones for 2.5 and 3.5 inch IDE drives. The nice thing about installing IEEE-1394 storage devices is that you don't need a driver at all, for Windows at least. The plain IEEE-1394 drivers built in to Windows 98 Second Edition and later - including Windows 2000 and Windows ME - know about plain storage devices and, as the saying goes, Just Work. A driver for the Mac's included with the reader. FireWire made a difference to the CompactFlash transfer rate - the Datafab reader scored a healthy 2200 kilobyte per second read rate. This isn't actually as fast as that CompactFlash card can manage, though; running as a plain IDE device in the neat little adapter I review here, I wrung about 2.5 megabytes per second out of another SanDisk card with the same innate performance as this one. But the FireWire reader wasn't far shy of the IDE-adapter score, and it's a neat and tidy hot-swap device, not a down and dirty one that requires you to restart any time you want to change cards. So if speed matters to you, this is the reader to choose. It's more than twice the price of the SanDisk CompactFlash reader, but it shifts bits more than 2.5 times as fast, so fair enough. If you have to buy an IEEE-1394 card to run it, though, the Datafab reader's more like five times the price of the SanDisk. The Datafab reader did turn out to be faster than the others, so there's reason to get one if you've already got IEEE-1394 ports. If you've got USB already, though, it's really not worth the money to get a 1394 card as well as a 1394 reader, if you don't have some other use for FireWire ports. Of the other three, the PQI is not pure rubbish, but its strangely slow performance and weird standard drivers mean I really can't recommend it. There are other dual-slot readers out there, which I hope to check out in the future. The two SanDisks are both fine; the new-model CompactFlash one feels nicer to use and is better priced. Any of these gadgets beats the heck out of serial transfer, and frees you from tethering your camera to the computer to transfer files. And you don't have to pay much for the convenience. Card readers kindly provided by flashmemory.com.au. Like other storage manufacturers, memory card makers fib about their card capacities. I've said it before, and I'll say it again - a kilobyte is 1024 bytes, not 1000. A megabyte is 1024 kilobytes, not 1000. A gigabyte is 1024 megabytes, not 1000. If you stick with the powers-of-ten numbers instead of the powers-of-two ones, though, you can make your storage device look bigger than it is. So storage manufacturers do. In this article I've just run out of energy and gone with what it says on the label, but "64Mb" memory cards still don't actually have 64 megabytes of capacity, even before losing some capacity to formatting (memory cards come pre-formatted, but it still takes up space). Some memory card makers give you more than the 1,000,000 bytes per "megabyte" they'd have to in order to line up with industry practice; my "64Mb SmartMedia card has 62.4Mb formatted capacity, while my "64Mb" CompactFlash one has only 60.9. But, to my knowledge, no memory card maker gives you the full 1,048,576 bytes per megabyte you'd expect. Down in the footnotes for the product specs, there's now usually a disclaimer saying that the manufacturers reckon a megabyte to be one million bytes. Time was when they didn't even bother with that. OK, fine. By the same token, I've got a car that does 400 kilometres1 an hour in first gear! Get a solid state drive on the cheap, with this CompactFlash-to-IDE adapter!